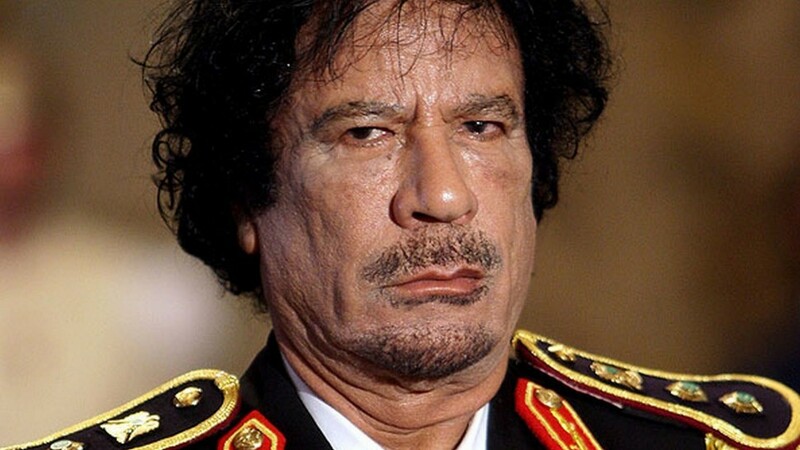 Libyan leader Colonel Gaddafi has ruled for over 40 years. He is a military man, having been schooled at military college in Libya, then furthering his training at the Hellenic Military Academy in Athens. In 1967 at the age of 27, he led a bloodless coup against the monarchy in Libya, and has ruled ever since. Another post looks at the Libyan Horoscope. We have no time of birth for Gaddafi but using the noon chart there is still enough to describe his nature, especially his reputation for oppression and cruelty. First up, the Sun is on the fixed star Rigel in constellation Orion. Orion is the Hunter, and it gives a strong and dignified nature, self-confidence, inconstancy, arrogance and violence, but danger of treachery. The star Rigel with his Sun causes courage, insolence, unruly temper, hasty actions, bloodshed, many enemies, fortune and military success . Ebertin has found that the Sun on Rigel will give a quick rise in life because of the strong, inherent will power, love of action and luck. Also that there is a continuous battle to maintain the high position, and this battle increases the vigor. However, Ebertin also discovered that people with Rigel on their Sun canl face failure, disappointment and fall from success if they do not show caution, or if they have an attack of weakness . Gaddafi’s Sun is now being aspected by the Jupiter Saturn opposition, Jupiter sextile his Sun, and Saturn trine his Sun. This does not suggest an attack of weakness, and Saturn trining the Sun does not indicate lack of caution. However Jupiter sextile the Sun could lead to an increase in the violence an over-kill, and the lack of caution. Jupiter opposite Saturn here indicates a major turning point in the global cultural, political and economic situation. The violence nature of Gaddafi is further explained by having Mercury on the fixed star Al Hecka, in the Horns of the Bull. The star is known for male violence, and with Mercury gives a hasty temper, selfishness, greed and loss of wealth . Mars is the planet of war and violence, and Gaddafi has Mars on a star called Procyon. Robson says this star gives “sudden and violent malevolence, sudden preferment by exertion, elevation ending in disaster” and with Mars “Cruelty, violence, scandal and slander, disgrace and ruin” . Interesting, Gaddafi has a very strong Lilith placement, with the dark feminine laying between his Sun and Mercury. His Lilith is also on the female warrior star, Bellatrix in constellation Orion. Gaddafi has an elite private body guard made up entierley of women. They are hand picked by Gaddafi, all virgins and forty in number. They are called the Amazonian Guard. Bellatrix is also called the Amazon Star, because of the link to the ancient nation of all-female warriors, the Amazons. The December Lunar Eclipse was right on Gaddafi’s Jupiter which on it’s own would sound favorable. However both Uranus and the Lunar Nodes are square his Jupiter at the moment, and will be for a few weeks. This has triggered his downfall, as Gaddafi has Jupiter on the fixed star Menkalinan, which Robson says causes “ruin, disgrace, and frequently violent death” . 1. Fixed Stars and Constellations in Astrology, Vivian E. Robson, 1923, p.125, 175, 192, 198. 2. Fixed Stars and Their Interpretation, Elsbeth Ebertin, 1928, p.32. OK I’m terrified…just heard they are thinking of limited nuclear war here. I hope Benghazi is liberated sooner rather than later. I also hope that the North Atlantic Torture Organization is disbanded as soon as possible. There was a quarter Moon at 26 Cancer conjunct Gaddafi’s Mars this morning. I’m adding the chart for the first news report of his capture today. sun conjnct Rigel are always war like. I know at least 3 ppl of this position and all with Mercury there too and yes they do have many enemies and they often don’t realize it. thanks for great astro insights, been following you for some time. Ah yes, the South Node is now on Rigel, activating his natal Sun. regardless his rising sign, (I pick cancer, he died at 4th/hs libra home)the many squares and opp signal a “times-up”. the departing libra saturn/sun conjunction add depth, length, sympathy, that squares his 1st/hs mars, is captured at home…the thing is he doesn’t die here, his memory, the saturn/sun conjunction is trans trine sun/ceres/mercury/jupiter…mental images, memory that expands overtime. Pluto and Uranus on his moon too. Public, Revolution. His Gemini stellium must have taken a bashing while Pluto was in Sag. He had the chance to regenerate/change but chose not to. So the change was made for him. With all that Gemini, did his right hand ever know what his left hand was up to? I doubt it! Also transiting South Node on his Sun as I just mentioned on Mels comment (previous page). The end at home. In your analyses of the chart on Libya do you see the tribes that had supported Qaddafi come together as one force and create a civil war .? And also like Che will Qaddafi become a martyr, a hero in future years to come ? What’s your source for the day of birth? Thank you for his chart . Sorry, but I’ve never like Moon in Aries. Misogynists all. Nice on Kannon, good to see you blogging! Muammer Gaddafi actually practiced moderation in possessions. He lived in a tent. This had camels, palm trees and circles for the pattern and it was yellow green and brown. It was really pretty and easy on the eye. He had carpet.,white plastic table and chairs, a low settee, another table with a white apple computer. The great leader of Libya built homes for all of the Libyan people from 1969 to 1976. He himself remained in his officers quarters.Muammer’s wife lived in a two bedroom house with one living room, one kitchen, one bathroom and that was it. Muammer advocated living modestly and practiced what he preached. The Libyan people could live very cheaply with petrol costing only a few dinars,subsidised organic bread, foods, free water, electricity and gas for household use.The women told me they could drive and walk about at any time of the day or night, alone and they felt safe. I questioned this but they were adamant about this. Libya fell because the nation lacked the defence systems of Russia and the terrorists of Libya,, active in Iraq, were joined by highly trained foreigners, and heavily armed. A lot of drugs came in at that time including captigen and the young were bribed with crazy sums of money to war against their people. Muammer gave his people direct democracy in the Jamahiriyah system He would suggest and ask them to consider but they would decide. He had influence and respect but no power. Muammer Gaddafi’s people did love him, I have heard enough and seen enough to be convinced of this. We should think of Muammer as a champion of the people and of women’s rights in the Muslim world. Muammer Gaddafi also helped Indonesia to negotiate peace between themselves at one time. There were so many other things Muammer did like the Great Green Charter, the great man made river, agriculture, healthcare, dentistry, student grants, further education, the grants, monthly income, interest free loans, refugees, migrants, all manner of help for the poor in Africa, African satellites, the African union and his intention of beating the world bankster system by issuing gold dinars and his plans for an African currency….He was killed by a corrupted world and we would do well to learn the truth about a great world hero. Please look up some of these.